The new EM-Tec range of FIB lift-out grids provides a secure way to attach TEM lamella prepared with Focussed Ion Beam (FIB) instruments. Available in multiple post configurations, with a shape optimized for easy accessibility, EM-Tec FIB grids are compatible with all standard 3 mm TEM grid holders. 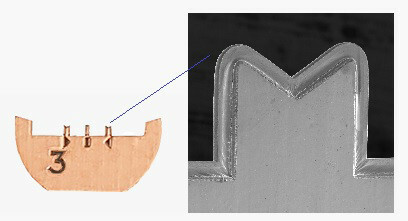 FIB lift-out grids have a thickness of 30-40µm, making them more rigid then standard TEM grids. Each EM-Tec lift-out grid has a number corresponding to the number of posts etched into the left side of the grid, which serves to readily distinguish front and back. This is combined with a series of unique symbols under each post for quick and easy identification. EM-Tec FIB lift-out grids are available in three types: copper, molybdenum and a unique, smooth-walled molybdenum. For challenging applications, requiring high temperatures or harsh treatments, the standard molybdenum EM-Tec FIB lift-out grids are available as 2, 3 and 4 posts. Molybdenum FIB lift-out grids inherently have some roughness of the side wall that takes valuable FIB time to smooth out before mounting a lamella. The new 3 post smooth-walled version of the molybdenum lift out grid saves valuable time on the FIB, by virtually eliminating or reducing the time previously needed for wall smoothing.